These I rarely read a book in one sitting. Maybe sometimes on holiday, but otherwise it tends to be when I am not very well. Such a day came last week – just a cold, but I didn’t feel up to much. 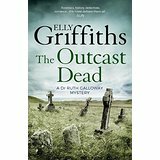 I retired to bed with Ellie Griffith’s The Outcast Dead, which I’d been saving for when I wanted a treat. There was no-one at home so I read it straight through without interruptions, including over lunch, and I enjoyed it hugely. I used often to read like that – for hours on end. I remember as a teenager that a favourite place to read was sitting on the stairs, back against the wall, feet against the bannisters, while the sunlight through the stained glass of the front door of our between-the-wars semi sent shifting patterns moving across the hall carpet. The great thing about a one-sitting reading is that you don’t forget who characters are or mislay bits of the plot. You get completely immersed in the book, sinking into it, leaving your ordinary life behind. Of course not everything can be read like this. Proust or Tolstoy demand a greater expenditure of time – the reading has to be spread over days, weeks, or maybe months – and that sense of living in a parallel universe is part of the experience of reading the book. But I like a crime novel to be short enough to read in one sitting – and if the writer has done their job, I should want to read it in one sitting, drawn on and on until at last the final page is reached, it’s over, and with a sigh of satisfaction, I close the book (and go online to download the next in the series). I’d intended to spread reading this over several months, but in the event it took a lot less. I was just enjoying it so much that I wanted to keep on reading, though maybe at some points enjoyment isn’t the word, cathartic may be better. One of the fascinating things about rereading a great work of literature is that it is in a sense revisiting one’s own past. At this point, look away now if you don’t want to know exactly what happens! Another part of the novel that amazed me and that I still think wonderful is the reaction of Karenin, Anna’s cuckolded husband, when his wife nearly dies giving birth to Vronsky’s baby, and he experiences an outpouring of tenderness for her and the baby. And what still remains for me as a stroke of breath-taking brilliance is our last glimpse of Vronsky after the death of Anna, as he paces a railway platform, on his way to fight in Serbia, not caring whether he lives or dies. It’s not just that their first meeting and Anna’s death are recalled by the setting, but Vronsky also has toothache. ‘The nagging pain in the strong tooth, filling his mouth with saliva, prevented him from speaking . . . And suddenly a quite different feeling, not pain, but a general tormenting, inner discomfort, made him forget his toohache for a moment.’ He recalls running to the station after Anna’s suicide and the sight of her head body. ‘He tried to remember his best moments with her, but those moments were forever poisioned . . . he ceased to feel the toothache, sobs distorted his face.’ This seems to me to encapsulate what separates Tolstoy from other writers. The interplay between the physical and the emotional brings home the depth of Vronsky’s grief in a way that nothing else could and I can’t imagine any other writer doing it in quite this way. This seems a good point at which to end today, but I’ll be blogging more about ANNA KARENINA. ‘All happy families are alike but an unhappy family is unhappy after its own fashion.’ This, the opening sentence of ANNA KARENINA, is one of the most famous in literature. But would it be better like this: ‘All happy families are alike: each unhappy family is unhappy in its own way’? I’ve decided that it would, which is why I am reading the recent highly acclaimed translation by Richard Pevear and Larissa Volokhonsky for Penguin Classics instead of Rosemary Edmonds’ 1954 translation in my old Penguin edition. I read the novel when I was a very young woman and re-read it, too. I agreed with William Faulkner. When he was asked to name the three best novels ever, he replied, ANNA KARENINA, ANNA KARENINA, ANNA KARENINA.’ Mind you, I hadn’t read Proust then. I’ve been meaning to reread ANNA KARENINA for a while. But at well over 800 pages it is a commitment. I suggested it to my reading group and we decided to have it an optional extra which we could spread over a year. I am well over half way through and it is as brilliant as I remembered (though some of Levin’s thoughts and discussions on Russian politics and agricultural economy are as dull as I remembered, too). That’s for now. I’ll let you know what I think when I’ve finished it.